Hello Sir, Welcome to Writer's Destination. I was born and raised in Cuttack, Odisha. I finished my schooling and graduation there. Studied science and then law for a career. I love the study and the profession of law, but if I were to tell you the truth, it was always actually arts that I wanted to pursue. I’ve tried to hold onto it in whatever shape and form that I can. When I am not working, I am reading, writing or watching cinema. If you wish to know me as a person, then the following lines by J.L. Borges may help you. "They speak of humanity. My humanity is in feeling we are all voices of the same poverty. An old sword, the willow grove's visible prayer as evening falls. I pass through the loftily covetous multitude. I walk slowly, like one who comes from so far away he doesn't expect to arrive." I often feel I am unable to do justice to what I really want to say. It is the falling short of my own abilities that scares and annoys me. I remember discovering fondness for writing when I was in the twelfth standard. It was during this time that I read a lot of novels and fell in love with the beauty of written words. It didn’t take me long thereafter to attempt writing my own stuff. Promises of a firefly was written over a period of eighteen months. I do take a while to finish my drafts and then I do a lot of rewrites. Well, it has to be the way I get stuck with the various ways of expressing a particular event or a scene. I had never thought of writing a book. Till I met Mahua Ray Das, a phenomenal artist herself, who on our very first meeting decided to push me towards that goal. She was cynical about my writing but gentle in her guidance, even when I was hostile to her suggestions. She set my sail on that course. It was not easy. I was constantly mired with problems but she never gave up, even when I was forcing her to. Her contributions for this book are immense. 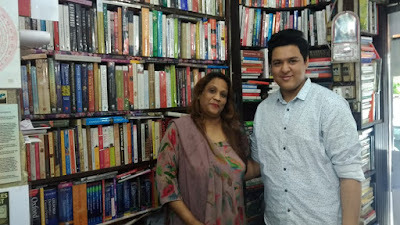 The journey for this book began with her eliciting a promise from me in a small book café in Bhubaneswar in August 2015, the promise that I’ll give her a book of my own one day. The things I experience watching the lives of others around me, the voices within me – they all push me to write stories. They compelled me to write my first book. I haven’t begun working on one. But I am guessing it would be on life and love. My debut book, no doubts there. I would prefer to leave this for others to say. Especially those few who know about it. Q12. Whatwas the hardest part of writing this book? When a writer is able to catch the tone of his characters in ink, and everything is flowing out smoothly from his pen, it is the most complete he will ever feel. But when it doesn’t happen that way, there is barely anything he can forgive in this world. Then there would be work and health conditions and lack of imagination and all sorts of things that would make me want to shut everything for once and for all. I don’t know about others but for me, writing is walking down an untaken road where there are equal chances of confronting delight and despair. But you brave that chance because you want to bring to life moments you think deserve to be experienced by your readers. When you’re penning those mistakes, regrets, hopes and love your characters find on pages, you are creating experience, and you cannot create any without letting it touch you. I have always only written in one method, one hand dipped in ink and the other in shades of life. It’s a fulfilling endeavour. But it comes with the risk of emotional turmoil. I think the future of writing and reading is very promising in our country. So many young authors are coming out with their works. It’s a very encouraging sign. Oh, I would definitely read a truckload of more books than I have and perhaps also join a writing course. You are a very talented person, Eshan. Your book proves that. You’re full of enthusiasm and conviction. I wish you all the best for your future endeavours. I enjoyed answering your questions. They have been meaningful and challenging to answer. I like to read, travel and spend time with my family. As I said, I have not begun working on any. Q19.What is the biggest surprise that you experienced after becoming a writer? That people connected with what I wrote. It was truly a pleasant surprise. I am a beginner and therefore not actually in a position to give advices. But I believe that every person trying to write should write with honesty. There is no good or bad writing as long as you can bring out the voice within you truthfully on paper. Q22.Do you have anything specific that you want to say to your readers? About the book, I’ll say this. Since the book was published, I’ve been asked about its theme. I'd like to say that the stories in Promises of a firefly are not light tales or have cheerful narratives for they intend to show us our boundaries regardless of the occasional heroics life affords us. Now, that is not necessarily tragedy. It could be something as simple as truth. Some of these truths, we are likely to have seen or heard around us. And as one of my readers told me over e-mail, there is this element of hope that can be found if the stories are read carefully. I want readers to find out for themselves. And if they are able to remember the stories, recall their moments when they are not holding my book - that would be a great thing for the storyteller in me.